2 ways to copy data to Power BI from online services! 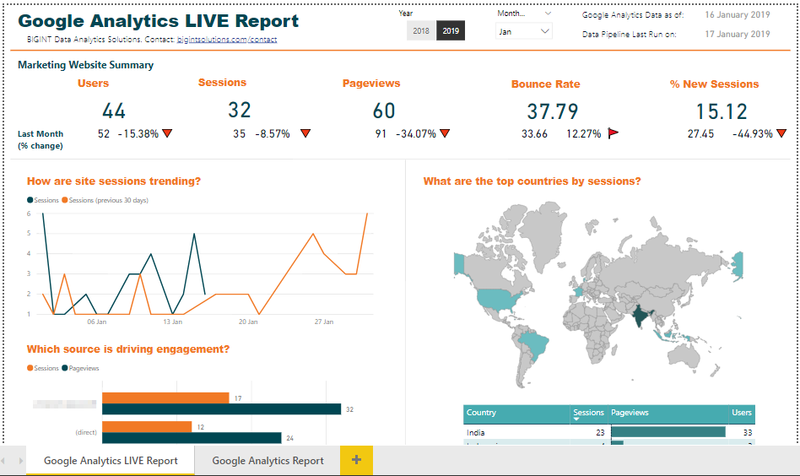 Tons of questions on how can we copy data from Facebook Ads or HubSpot or Google Analytics to Power BI. There are a couple of reasons why you want to analyze data from multiple online sources with Power BI. Say you want to analyze how much traffic and number of leads (CRM) are generated by spending on Ads on Google and Facebook. And, how many of them actually purchase (Stripe or PayPal)? You can go to each of these service providers dashboards and get answers to your questions, one by one. Or, you can copy data from these providers into a single system say Power BI and analyze data together. Which one do you think will give you a clear business picture and with much less overhead? Clearly the Power BI one! Power BI provides data connectors to a good number of services already. Google Analytics, Facebook Page, MailChimp, SalesForce, MixPanel etc. But there are a number of sources for which you do not have data connectors yet – HubSpot, Facebook Ads, Instagram Ads, LinkedIn Ads etc. 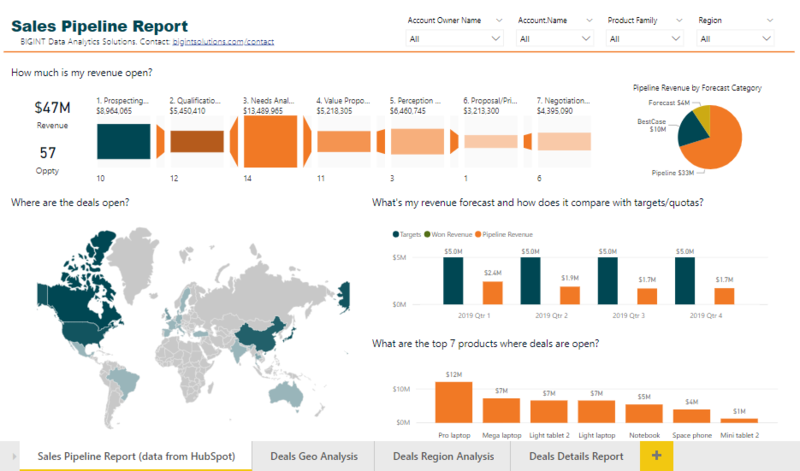 Of late I have been seeing a lot of requests to copy data from HubSpot to Power BI! This post talks about two general approaches to copy data to Power BI from online services for which we do not have data connectors. Which approach to go with will depend on how you want to reuse the data from these services. Question 1: Are you going to use the data only in Power BI/Excel and only for visualization and analysis? Question 2: Are you going to use the data in another application or going to reuse that data for Machine Learning or other use cases? Question 3: How big is your data? If your data is small* and does not have to be used outside of Power BI/Excel and the purpose is only visualization and analytics – go with Approach 1. Else go with Approach 2. Approach 1 is quick to implement and will incur a less overall cost. Approach 2 could take time to implement and has several other components than just Power BI (read on). Approach 2 also provides you ability to pull incremental data. While in Approach 1 (Pro users) you have to pull full data every time. *Note 1: I have seen Power BI experience getting degraded if your model size becomes more than 300 MB. Examples to showcase how to use Approach 1. You can go with either “Get Data” way or a Custom Connector way. I will show steps for “Get Data” way to connect to HubSpot (CRM). Step 2: Select “Advanced” radio button and put API details. The screenshot below shows examples for connecting to HubSpot ‘Companies’ API endpoint. Transform JSON data to tabular format using Power Query transformations. Sales Pipeline Report from HubSpot data developed by us. Examples to showcase how to use Approach 2. Here we take Azure Data Factory as a mean to pull data from Google Analytics API. Note: In the example below “FlattenJSON” is an Azure Function to simplify complex JSON returned by Google Analytics API. I have seen customers going with Approach 1 almost always since this saves time and cost. I have also seen customers going with Approach 2 when data sources involved is more than 5 or so. Note 2: Power BI has dataflows which may replace Azure Data Factory in scenarios above. The dataflows are still in preview. Note 4: Power BI team has released AI features in private preview so you can apply ML techniques to your data in Power BI! More on that in this blog post. Note 5: You may contact us if you need similar data movement and analytics for your online services data! Key driver analysis – What influences attrition? If you want to get answers and information about any of our products and services, or simply want to know more about us, get in touch now. We are a team of professionals who eat, sleep and breathe ‘data’. We are passionate about Data Analytics, Visualization and Data Engineering using state of the art tools, techniques and scientific methods. We believe in the motto: The story is mightier than the spreadsheet. Our passion lies in enabling our customers improve their decision making processes. Please contact us for your data and analytics needs.